Planning for what is now known as the Dwight D Eisenhower National System of Interstate and Defense Highways (“The Interstate System”) began in the late-1930s. They then studied the feasibility of a toll-financed system of three east-west and three north-south superhighways – the subsequent report concluded a toll network would not be self-supporting. Although the Federal-Aid Highway Act of 1944 authorized designation of a “National System of Interstate Highways,” the legislation did not authorize an initiating program to build it. After taking office in January 1953, President Eisenhower made revitalizing the Nation’s highways one of the goals of his first term. As an army Lieutenant Colonel in 1919, Eisenhower had accompanied a military convoy across the US and saw the poor condition of our Nation’s roads. Later, during World War II, as Commander of the Allied Forces, his admiration for Germany’s Autobahn network reinforced his belief that the US needed first-class roads. President Eisenhower continued to urge approval and worked with Congress to reach compromises that made approval possible. The President signed the Federal-Aid Highway Act of 1956 on June 29, 1956. The feds provided a 90/10 math – 90% of the funds for the Interstate Highway System from the feds; each state was required to match the remaining 10%. The numbering of the interstate highways on the system was developed in 1957 by the American Association of State Highway Officials (AASHO). The numbering pattern of Interstates is the reverse of US Highways; for example US Route 10 is in the North of the USA, while Interstate 10 is in the South. In the numbering scheme for the primary routes, east-west highways are assigned even numbers and north-south highways are assigned odd numbers. Odd route numbers increase from west to east, and even-numbered routes increase from south to north. Major north–south arterial Interstates increase in number from I‑5 between Canada and Mexico along the West Coast to I‑95 between Canada and Miami along the East Coast. Major west–east arterial Interstates increase in number from I‑10 between Santa Monica, California and Jacksonville, Florida to I‑90 between Seattle, Washington and Boston, Massachusetts. On one- or two-digit Interstates, the mile marker numbering almost always begins at the southern or western state line; the exit numbers of interchanges are either sequential or distance-based so that the exit number is the same as the nearest mile marker. As a result of statehood for Alaska and Hawaiʻi in 1959, US Bureau of Public Roads was directed to study the needs and opportunities for Interstate routes there. The result was the initial identification of three Island Interstates – H-1, H-2 and H-3. These roads also have names: H-1 is called Queen Liliʻuokalani Freeway (from exits 1-18 – about Middle Street) and Lunalilo Freeway (from exits 19-27.) H-2 is called Veterans Memorial Freeway and H-3 is called John A Burns Freeway. H-1 runs along the southern shore of Oahu, from Kapolei, around Pearl Harbor to just past Diamond Head State Monument. H-2 extends north from H-1 and Pearl Harbor to Wahiawa and the Schofield Barracks Military Reservation. H-3 runs from northwest Honolulu at Āliamanu Military Reservation to the Hawaii Marine Corps Base on Kāneʻohe Bay. Interstate H-1 was first authorized in as a result of the Statehood Act of 1960. 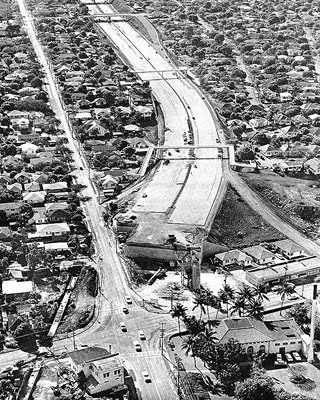 Work was completed on the first segment of the new H-1 Interstate, spanning 1-mile – from Koko Head Avenue to 1st Avenue, on June 21, 1965. A temporary westbound exit to Harding and a temporary eastbound entrance from Kapahulu Avenue allowed motorists to access the new freeway until the Kapiʻolani Interchange was completed in October 1967. H-4 was an idea once proposed for the city of Honolulu in the late 1960s. Interstate H-4 was to provide traffic relief for the congested Interstate H-1 through the downtown area. From the west Interstate H-4 was to begin at Interstate H-1/Exit 18 interchange, head to the waterfront to a point somewhere between Atkinson Drive and Waikīkī, then head back up to the Kapiʻolani interchange (Exit 25B) on H-1. The image shows H-1 Freeway ending at Kapahulu and Harding Avenues looking eastbound with temporary on- and off-ramps to Kapahulu and Harding Avenues (1965.) In addition, I have added other images in a folder of like name in the Photos section on my Facebook and Google+ pages.